Audre Lorde wrote, “Poetry is not only dream and vision; it is the skeleton architecture of our lives.” Poetry is an intimate affair and the best way to experience it is to see it performed in person. 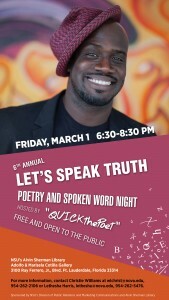 Come out and listen to MC Quick the Poet as well as local spoken word artists and poets during this celebration of creativity on Friday, March 1, 2019 from 6:30 – 8:30 p.m. in the Alvin Sherman Library, Cotilla Gallery, 2nd Floor. Call 954-262-2106 for more information.